I work in a basement. Don’t worry, though! It’s not nearly as dismal as it sounds. There is plenty of light, and I’m surrounded by objects and photographs older than my grandparents. But when you’re in a basement, surrounded by so much history, it can be difficult to keep up with what’s going on in the present. That’s why, yesterday, as I was leading a walking tour through Oberlin, I was shocked to be overtaken by what seemed like thousands of new faces. My penchant for exaggerating numbers aside, the fact remains that summer is ending. Whether we like to admit it or not, it’s time for a new school year. A new school year means new college freshman and parents wandering aimlessly and asking questions. I’ve heard some complaints, but I love it. When you live somewhere full-time, it can be easy to take it for granted. Oberlin is a beautiful city and full of a rich, dynamic history. Seeing the excitement of the new students and their families as they take in the sights and sounds of Oberlin reminds me that I’m pretty lucky to live here. I wanted to give the new students some words of encouragement, but felt unqualified. After all, less than a decade ago, I was one of them. I wore a lanyard; I forgot my umbrella; I asked where the Conservatory was while standing inside the Conservatory… But! If the two years since my graduation have given me anything, they’ve given me unrestricted access to some of Oberlin College’s early documents. So, naturally, I turned to history to find the words. 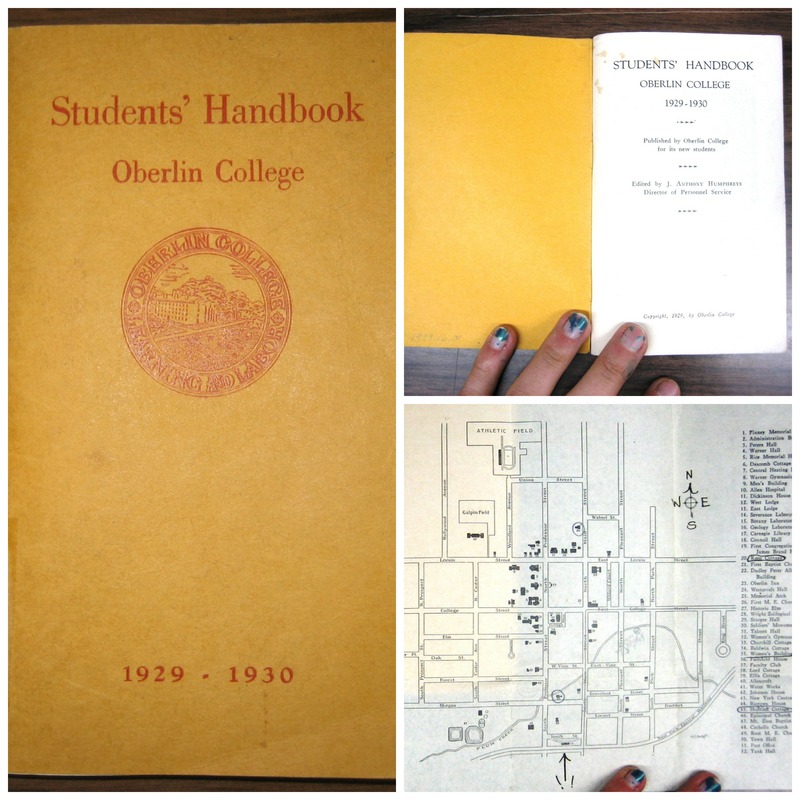 In the Oberlin Heritage Center resource library, we have a small, yellow book. In crimson text, it reads: Students’ Handbook, Oberlin College, 1929-1930. The information inside is charming, if mostly irrelevant to today’s college experience. If you do not find it helpful, I hope you will at least find it funny, because, if I learned anything in college, it was the value of a shared laugh. Without further ado, I present: College Advice from the Thirties. They even included a helpful, fold-out map in the back! You will graduate in the very year in which Oberlin is to celebrate its one hundredth anniversary. That puts it up to us to give you the benefit of a hundred years of teaching experience; and it puts it up to you to prove worthy of a rich opportunity. Oberlin is recognized nationally as one of the great colleges of the country: we count on you, giving as well as getting, to help us to maintain its high standard. The best of luck to you, and, more than that, the best of planned and earned success! Keep well physically; get plenty of sleep and enjoyable physical recreation; eat regularly and sanely. Cultivate cheerful acquaintances; develop a few true friendships. Be active in group social affairs; develop buoyant liking for people. Live in the world of people; learn to adapt yourself to people rather than avoid them. Be thoughtful of other people, rather than thinking about yourself and your possible troubles. Project your thoughts outward—concerning other people and other situations—rather than inward, concerning yourself and your worries. Cultivate confidence in yourself without developing self-conceit. Exercise your mind; stretch it for all you are worth. Hard work will not injure your mind. Think for yourself; have your own opinions, but avoid obstinacy. Chapel services are held in Finney Chapel from 12:00 noon to 12:20 week days, except Monday and Saturday…It is traditional that the student body rise as the President enters and remain seated until he has left the platform. These meetings serve as a most effective means of achieving college unity. One carries away genuine inspiration and a sense of peace and quiet. All freshman men count it a privilege to be graced with the traditional Frosh cap. Buy one early, for it must be worn every day except Sunday until spring. An excellent chance is afforded first-year men to settle any minor differences with their 1932 superiors in the Annual Frosh-Soph Scrap early in the fall. Ropes are provided all men and after thrilling cat-calls from opposite sides of the football field, the men rush towards one another. The object is to tie their antagonists’ hands and feet and carry them off. Wear old clothes! Early each fall freshman and sophomore women vie with one another in a good-natured “scrap” or contest to determine whether the Frosh women shall wear their distinctions until Thanksgiving or Christmas. Rallies or “pep meetings” are held before important football games. The speeches are rare and the singing boisterous. Masculine vitality runs free and numerous stags given at the M.B. [Men’s Building]. Donuts and coffee, worked off by boxing and wrestling, make one sleep blissfully. Senior distinctions and caps and gowns appear after spring vacation. From then on the Seniors rule the Campus with their dignity. This entry was posted on Thursday, August 28th, 2014 at 2:02 pm	and is filed under Uncategorized. You can follow any responses to this entry through the RSS 2.0 feed. Both comments and pings are currently closed.